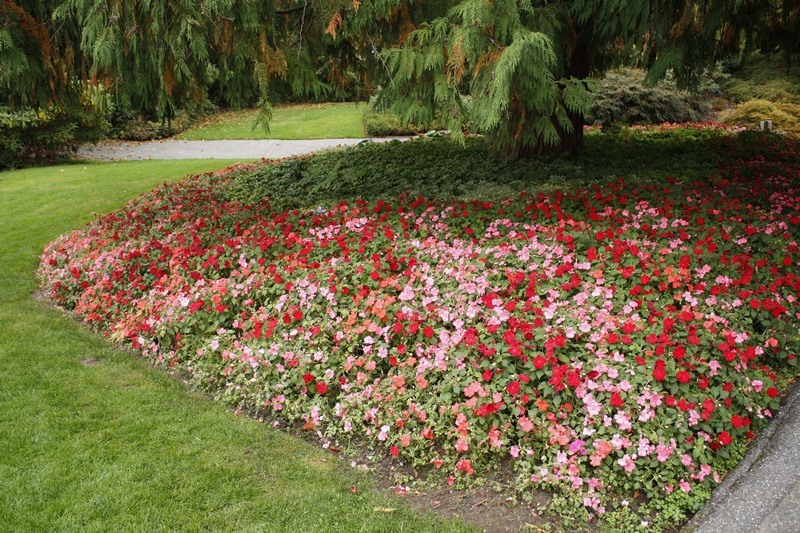 In Vancouver the other week I saw a strange but colourful sight - a bed of Impatiens in full bloom! 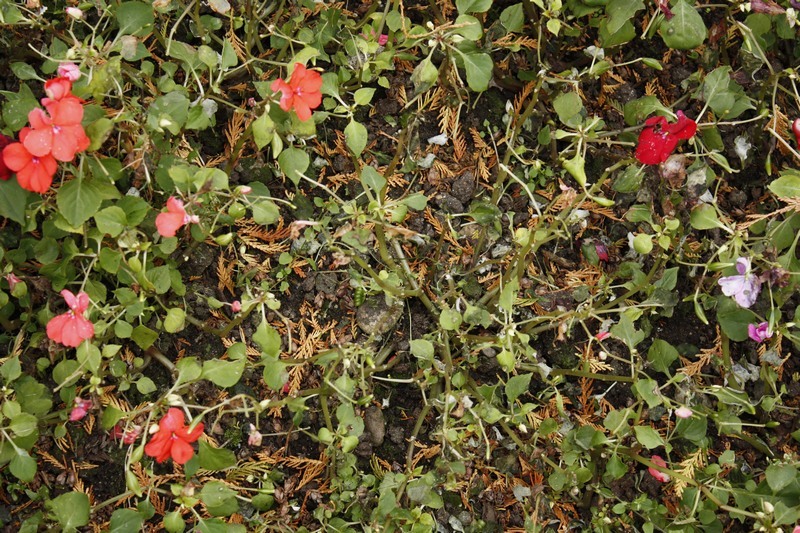 UK gardeners will know that a particularly devastating form of downy mildew started hitting Busy Lizzies a few years ago, to the extent that they have almost disappeared from UK gardens. From top of the bedding charts a few years ago to almost obscurity! I was pleased to see these in Vancouver, thinking that the disease hadn't traveled that far but in a corner of one bed there were clear signs of defoliation and wilt - so sad! And there are no chemicals that effectively control this disease, although the New Guinea Impatiens seem more resistant. Colourful but why do they put red and pink in the same mix - ugh! Makes me think of the other diseases that have changed the face of both gardens and the countryside. Back in the late 1960's and 70's a particularly virulent form of Dutch elm disease swept across the UK destroying virtually all the English elms. At the time I was teaching at a small horticultural college in west London and I recall the optimism with which we watched technicians injecting local elm trees with fungicide. It didn't work and elm trees have almost disappeared from gardens and the English countryside. Some elms remain in the areas around Brighton but most elms in landscapes now are resistant cultivars such as 'Sapphoro Gold'. Dutch elm disease has also affected trees in the USA, Canada and other parts of Europe. 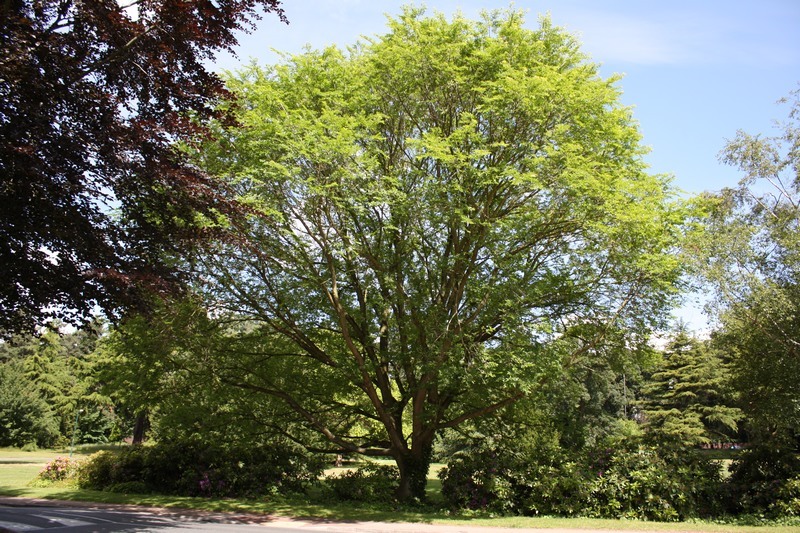 Ulmus 'Sapphoro Gold' on the University of Nottingham campus (my previous patch) - the largest specimen of this in the UK and so classed as a Champion tree. Anyone who reads the news will know of the current threat to ash trees by ash die-back disease. Then there is sudden oak death, a particular form of Phytophthora that affects not only oak but several other key woody species such as Rhododendron and Camellia. 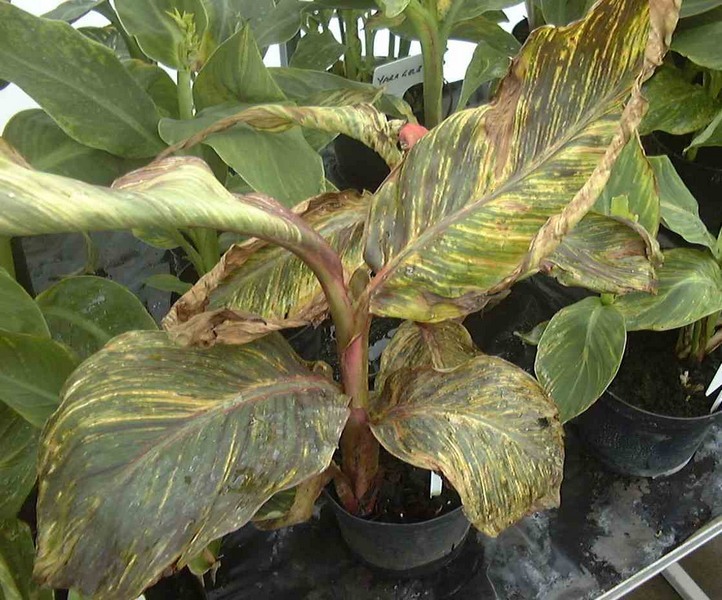 Gardens that specialise in these plants are very watchful for any signs of this devastating disease. 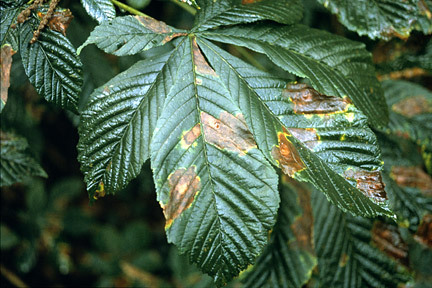 Observant gardeners will have also seen the unsightly blotches on the leaves of horse chestnuts caused by a harmless leaf blotch fungus. Then there's bleeding canker which also attacks horse chestnut causing unsightly seepage down the trunk and is far more serious and usually fatal. At a personal level, the virus which has swept through stocks of cannas in recent years nearly bankrupted me! At the time, I ran a small nursery, Brockings Exotics and had the National Collection of Canna, some 500 cultivars from all over the world. I sold the surplus by mail order to keen collectors in the UK and Europe. When virus first appeared from some imported stocks, neither the Plant Health Inspectors, nor the RHS could identify the problem, so infection spread. By the time we had identified the issue and implemented plant hygiene procedures, the damage had been done. Eventually the collection had to be burnt and my business closed. I have clear memories of sending back dozens of refunds with notes of apology! 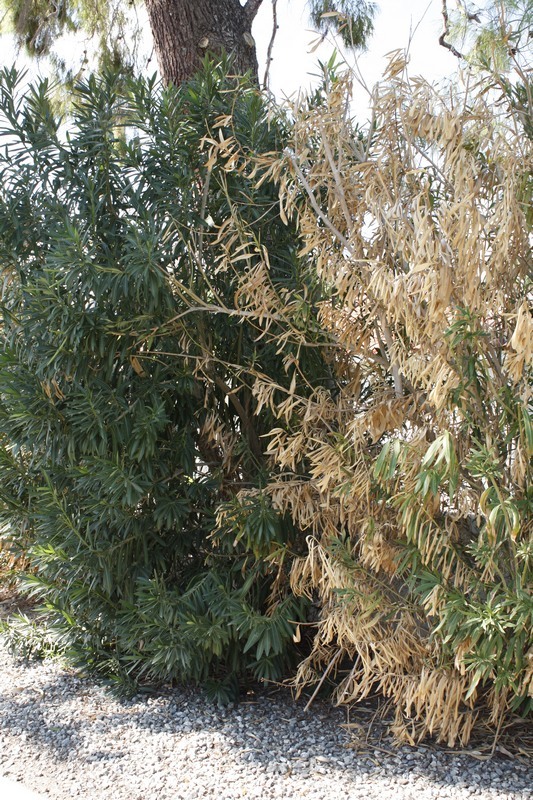 Out here in California oleander leaf scorch disease is sweeping through landscape plantings leaving swathes of dead and dying plants where there should be lush foliage and colourful flowers. Even more serious is the threat by Asian citrus psyllid which is a risk not only to the many citrus trees in landscapes but also to the many commercial plantations of citrus. Strict import procedures exist and inspections of trees even at a domestic level occur to try and keep this pest at bay! Oh dear - this really is a story of doom and gloom but let's be positive! 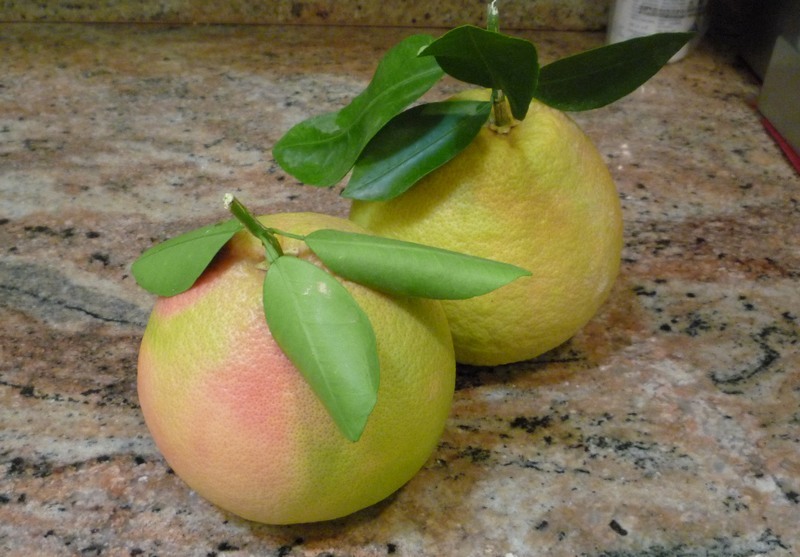 At the moment the citrus around our development are strong and healthy. Just recently we have started picking the grapefruit which we eat for breakfast every day. Just look at the colourings on these fruit. Strangely each of the pink patches coincide with where a leaf was touching the fruit - just beautiful! The flesh is red and juicy and the flavour is wonderful!